In a previous 2-part article (1), the authors wrote about the faulty associations of the Sumerian deities known as the Anunnaki as they are portrayed in the books, television series, and other media, which promotes Ancient Astronaut Theory (hereafter “A.A.T.”). The article traced the portrayal of the Anunnaki popularized by A.A.T. back to Zecharia Sitchin’s Earth Chronicles book series, and pointed out that Sitchin’s version of the Anunnaki appear nowhere in ancient Sumerian literature. Since the publication of the original article, there have been requests for more background on the discrepancies between what the Sumerian texts actually say, and Sitchin’s personal “translations” which supposedly occurred in the 1970s. This article offers more details on this subject, and also presents some of the reasons why the authors feel that it could be of some importance to regard Sitchin’s legacy with a certain degree of skepticism. Central to Sitchin’s narrative are a group of alien beings known as the Anunnaki, whom he claimed crossed their own DNA with that of Homo erectus in order to create mankind—for the purpose of using humans as slaves to mine gold and other minerals. Today these Anunnaki are often variously portrayed in A.A.T. literature as the scientific equivalent of the creator of the human race as portrayed in numerous religions. Anunnaki actually means “Princely Seed” or “Princely (royal) blood”. Sitchin’s translation of Anunnaki as “those who from heaven came” is itself an error or was completely fabricated, and all modern translations of the term in this fashion are merely relying on Sitchin’s own publications. Scholars are free to search the entire spectrum of Sumerian literature at The Electronic Text Corpus of Sumerian Literature (2) to test any of the terms referenced by Sitchin or the present article for themselves. The Anunnaki are never depicted as alien space gods in Sumerian art and iconography, and those symbols which Sitchin’s legacy has led many to believe represent them actually refer to other deities. For instance, the winged disks and crescents, which proliferate so much Sumerian iconography, actually represent specific solar and lunar deities—not the Anunnaki. Regarding the subject of ancient divinities mining gold, it may surprise many readers to learn that Sitchin himself never provided a textual reference from the Sumerian corpus to support this theory, which has gained incredible popularity. A search of the instances of gold as found in the Electronic Text Corpus of Sumerian Literature fails to find any reference to ancient gods mining gold. In The 12 th Planet , Sitchin claims that Bel Nimiki (an exaltation of Ea) should be translated “Lord of Mining”. However, there is no justification for this translation, and neither do any of the portrayals of Ea in the Sumerian texts associate him with lordship over ancient gold mines. In reality Ea is routinely associated with wisdom or knowledge, providing further grounds for the common translation of Bel Nimiki as meaning “Lord of Wisdom”. Is the Universe Only 6,000 years old? Young Earth Creationists Say Yes! The Sumerian corpus nowhere states that the creation of Adamah or mankind was done so that humanity could serve as a slave species to mine gold, and it certainly does not depict an Anunnaki scientist crossing alien DNA with primates. Sumerian literature plainly tells the story of humanity being created by the gods to assist in the process of creation itself. As humans multiplied and grew too noisome, the gods became annoyed and sent a great deluge to wipe them out. The cuneiform has it that one man was instructed to build a boat, and he and his family and select animals were saved from the seven days and seven nights of rain which caused the flood. 1) Nibiru is called a star. 2) Nibiru is called a planet – nearly always Jupiter-Marduk, but once Mercury, and never anything beyond Pluto or the known planets. 3) The Sumerians, by their own records, knew of only five planets (and accepted the sun and moon as planets). 4) Nibiru is never mentioned in any respect with the Anunnaki; it is never said to have been or be inhabited. 5) Nibiru is both a “fixed star” in some relationship to constellations (whether a member or just in proximity is unknown) that “holds” them in their courses, but is also described as “changing position” and “crossing” the sky at times. 6) Nibiru was seen every year, which demolishes Sitchin’s view of a 3600 year cycle for it. Sitchin’s claim that the Sumerians had extensive knowledge of the solar system is incompatible with the system of cosmo-astronomy recorded by the Sumerians themselves. While the texts do associate particular planets with certain deities, the cuneiform never actually mentions more than seven planetary bodies (counting the sun and moon). For example, the two MUL.APIN tablets date the rising of 36 fixed stars, as well as the paths of Venus, Jupiter, Mars, Saturn, Mercury, and the Sun and Moon. 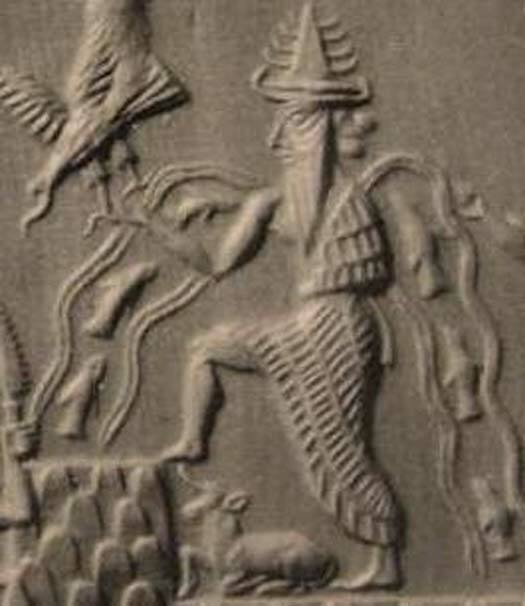 In The 12 th Planet , Sitchin cites Cylinder Seal VA243 (in the collection of the Vorderasiatische Museum in Berlin) as evidence that the Sumerians had acquired extensive knowledge of the solar system from extraterrestrials. The seal has since become famous among proponents of Sitchin’s theories and has sent numerous researchers on quests around the world to discover similar works. Sitchin claims that a symbolic image in the upper left of the seal represents the sun and 11 planetary bodies—thus affirming his “12 th Planet” scenario. The image is of a central circular globe enclosed within a six-rayed star, surrounded by 11 small “dots”. However, as Heiser points out (4) celestial objects with 6, 7, and 8 points in Sumerian art always represent stars distinct from our local sun. The Sumerians actually represented the local sun (and the solar deity Utu or Shamash) with one of two symbols: either a circle with four “arms”, between which emanated four “waves”, or the solar winged disk. Neither of these symbols appears on VA243. Furthermore, Sumerian art is replete with examples when the true symbol of the sun appears alongside the 6, 7, or 8-rayed symbol for “star” that does appear on VA243, demonstrating that the solar and stellar symbols were not interchangeable in the Sumerian cosmos. It has been suggested that VA243 may actually represent an offering being made to a fertility deity (4). This could be supported by the interpretation of the seal, which reads, “Dubsiga, Illi-illat, your/his servant” (5). In fact, there are hundreds of cylinder seals similar to VA243 known as “offerings” seals, which feature a 6, 7, or 8 rayed “star” symbol above the heads of the deities in order to distinguish them from mortals in the imagery. Why is it important to test the theories of Zechariah Sitchin? Actually, it is vitally important to question any narrative that purports to explain the origins of mankind and our place in the cosmos. However, Sitchin’s works—along with those of Erich von Däniken—have triggered the rise of a theory which today is more of an industry than a field of research. And as an industry which up sells by offering an intriguing explanation for mankind’s origins (ancient genetic engineering) an apocalypse (when Nibiru returns), a hope for future redemption (when E.T. returns to save us), and a new type of scientific “deity” (the aliens themselves), A.A.T. may be properly defined as a growing religion. Recent studies have shown a decline in traditional religious practices in America (6). A survey conducted in 2014 demonstrated that 35% of people born between 1981 and 1996 consider themselves to have no religious affiliation (7). On the other side of the coin, another recent survey by 20 th Century Fox revealed that around half of Americans believe in the existence of extraterrestrials, while slightly less than 39% believe that aliens have visited earth in the past (8). Is A.A.T. rising to fill the void left by the decline of traditional religion in the west? It probably is for some, which is unfortunate considering that A.A.T. itself can be demonstrated as being replete with all of the faults usually associated with establishment religion—such as relying on mistranslations of ancient texts, being based upon the fantasies of writers, and using divine or religious symbols and stories to promote a capitalistic endeavor (marketing). How can free thinkers continue to fail to regard newly emerging paradigms with the same critical eye with which we view those of the past? Another reason why A.A.T. should be regarded with a healthy degree of skepticism is that it has emerged to become a universal “X-factor” to explain many of the very real mysteries of humanity’s past. Today there are versions of A.A.T. for audiences of all stripes, as the “aliens” become interchangeable with fallen angels, the nephilim, etc. As such, “ancient genetic tampering” or “ancient aliens” are becoming envelopes used to explain archaeo-astronomy, artificially elongated crania, ancient megalithic structures, advanced metallurgy, very large or otherwise anomalous skeletal remains, and virtually anything interesting left behind by ancient humans. Since the need to write about an “X-factor” has grown to the point of encompassing the totality of history, it can only lead researchers to overlook the very real human element, which gave birth to the ancient world. As such, the authors suggest that future independent researchers who inquire into ancient mysteries begin by looking around, here on earth for answers, before looking to the stars. To read more of Jason and Sarah’s work, please visit Parradigm Collision . The truth is that the Feathered Serpent/Holy Spirit is the creator and the Lion/Jaguar is the Son of man. It is interesting to see that the mainstream scientists and the religious people won’t admit that there is a great possibility that there is life on other parts of the immense universe. I was raised in one of the mainstream religions and let me tell you that know I don’t believe in the explanations given to me by the Bible. I think that they were created to control the population of the world. How many people had die because they didn’t belong to one religion over the other? I've read all nine books of the Earth Chronicles series and find no reason to doubt Dr. Sitchin's scholarship. As a previous commenter has posted, Dr. Sitchin used other sources to confirm his analyses, including the text of the original Bible, in Hebrew. I would recommend skeptics and "believers" alike check out an excellent book by Dr. Chris Hardy, entitled Wars Of The Anunnaki, who espouses a feminist point of view and draws on other writers and resources besides Zechariah Sitchin to reach the same conclusions. Wow! These guys are researchers??? They seem either to be more like wannabe writers trying to break into the business or diehard Christians wanting to keep the world in darkness like Noah's son. The only thing that Sitchin was wrong about was his belief that the ancient serpant Enlil is the good guy and that the serpant Ea is the bad guy. For those who are interested, Graham Hancock covers these same points in his book 'Magicians of The Gods', arriving at the same conclusions. Interesting reading!